We are offering Gladiolus Flowers in red color which extremely attractive and witness wide demand among the clients. Procured fresh from the cultivation farms, we ensure that the freshness and appeal of the flower is not lost while in transit. We supply a wide variety of Gladiolus flower which is a winter-growing, summer-dormant plant, 400-600 mm high, producing three very narrow grey or greenish grey, strongly ribbed leaves that are covered with short, soft hairs. The plant grows from a small globe-shaped corm that is surrounded by hard, light brown outer tunics. We are one of the most well-distinguished companies in the market that are into offering Gladiolus Bulb Plant. 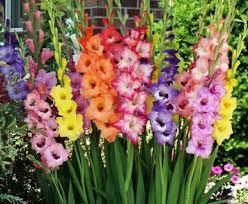 As a pioneer organization we deal in offering Artificial Gladiolus Flower. Some of the notable characteristics of these flowers are ecstatic and alluring pattern, world class material and variegated range. These are able to retain its original sheen for long periods of time and are in huge demand among our client base.